Color(s): Orange and white, brown and white, off-white, orange, brown, brown roan. They may have a brown mask. Originating in Italy, the Lagotto Romagnolo was used as a water retriever and hunter. This breed is believed to be the foundation from which all water dogs have descended. Their most notable distinction, however, is for being the only purebred dog in the world selected to search for Truffles which is an edible fungi. The Lagotto Romagnolo breed is small to medium in size. They are well-built, stocky, and vivacious. The Lagotto Romagnolo possesses extraordinary scenting abilities. They exhibit an attentive, intelligent, and gentle expression. A loyal and affectionate breed, the Lagotto Romagnolo is an excellent family companion. They get along with dogs and other pets they have been well socialized with. They do well with children and form close attachments to their home and family. This breed is highly adept at alerting and warning their family to visitors and danger. 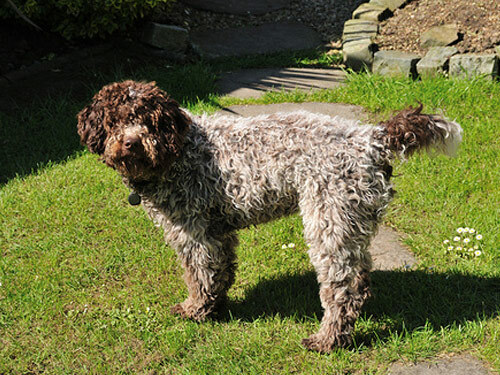 The Lagotto Romagnolo requires daily combing of the coat to prevent matting. Professional clipping of the coat should be done twice a year. Bathing should be done when necessary. They have a low incidence of hip dysplasia and cerebral anomaly. The coat of the Lagotto Romagnolo is thick, curly, and woolly. This breed is considered to be hypoallergenic and is lot to no shedding. Lagotto Romagnolo's are highly intelligent and eager to learn. Early socialization and obedience are recommended. They will not respond to harsh or heavy-handed methods. Training must be done with positive reinforcement, fairness, patience, and consistency. The Lagotto Romagnolo is not recommended for apartment living or sedentary owners. They require an inordinate amount of exercise and mental stimulation. This breed does best with a job to do in a rural setting. If they become lonely or bored they will become destructive. They love to dig, so landscaping must be protected. They excel in tracking, agility, and obedience.